The scene has been replayed in Hollywood so often it’s becoming a cliché. You’ll recognize it. There are two guys near the end of the movie, they’ve been struggling through tremendous odds and just when we think they are going to win, they are suddenly surrounded. With no hope for survival and in the most solemn tone possible, one turns to the other and says, “It’s been an honor to serve with you”. Of course we fall for it every time because we each feel a deep desire to have our own efforts viewed as honorable. I often think about the idea of serving with honor in the context of a marriage relationship. I have a viewpoint of the whole spectrum of marriage, beginning, middle, and end—that “until death do us part” part. From this vantage point, I have observed that it’s about honorably living out the marriage vows and applying them throughout the marriage. Serving with honor in marriage is not about duty and obligation. Duty and obligation will take a relationship only so far, far short of God’s intention. Honor is heart driven; originating out of a love for God then expressed toward one’s spouse. Because of this, honor surges forward when duty retreats. Honor goes above and beyond when obligation is met. Abiding honor in the marriage relationship seems to be far too rare. Honoring actions in marriage include ideas such as servanthood, self-sacrifice, treating one another as more import, saying “I was wrong” and “I’m sorry”, expressing love by more than words, listening without speaking, complimenting without critiquing, being proud without competing, and makes one’s spouse the top earthly priority, instead of offering our leftovers. Honor is being willing to die for your spouse but, more importantly, being willing to live for him or her. 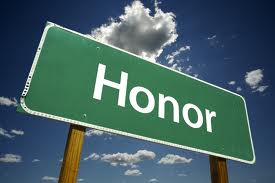 Honor gives freedom to each to be who God intended them to be and not molded into who we think he or she should become. Honor learns how to love and give respect. Honor lives within the Godly character of being a follower of Christ. Honor doesn’t wait until tomorrow to begin but starts today. Honor is something that is noticeable and impossible to hide. Search through the Church family; seek out those who demonstrate an honorable married life. Emulate the examples found worthy. Rise up husband and wife, become the marriage partner God has called you to become. For most of us, there will come a day that you or your spouse will be at death’s door. You will want to look deeply into each other’s eyes and say, “We had a good run. It’s been an honor to have served with you.” Be honorable today. Wow, I’m so proud of you. I loved the words from your heart. Ed and I lived that type of marraige. Now as a widow, I can only wait if God is going to bring me a Godly man to be that wife again and couple again. Chad and I are going to be moving to Florida after our home sells. WE won’t be far from Lockwoods. Would love to see you. I still am praying about the widow and widower material God wants me to write,. your writing seem to come to you so well put together. I would love to take a wirting class. Haven’t found one yet. I had a publisher talk to me about a book with royalties but I said no, this will be non profit for me.